On a medical mission to Mariupol, Ukraine our host church took us to the Sea of Azov for a relaxing picnic. A little ways up the coast stood the towering smoke stacks of a steel mill. The small public picnic area had no caretaker so litter covered the grounds. Our hosts apologized for the mess but in this industrial city it was all they had. We then stood in a large circle holding hands seeking God’s blessing on the food. After the prayer, I opened my eyes, the sun filtered through the trees giving a golden glow to everything and I took this picture. Some of the people by me asked why I wasted time taking a picture of a trash strewn scene. But that is not what I saw, for a moment it sparkled with light. An epiphany of how God saw the people of Mariupol, how He saw me. Not with all the trash we have carelessly littered throughout our lives, but with the light of Jesus transforming us into beauty beyond our wildest dreams. Mariupol currently is caught in conflict. Pray for the church in Eastern Ukraine. 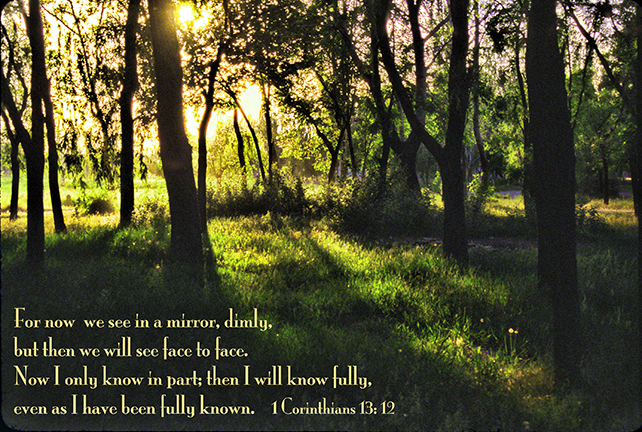 This entry was posted in Photography and tagged 1 Corinthians 13, devotional, landscape photo, sun light, trees by Stephen Hufman. Bookmark the permalink.